For the past year, I have been reading the stacks at the Burke Library. Not reading every book, but reading the collection: how it is organized, what subjects have more texts, what sections see more traffic. 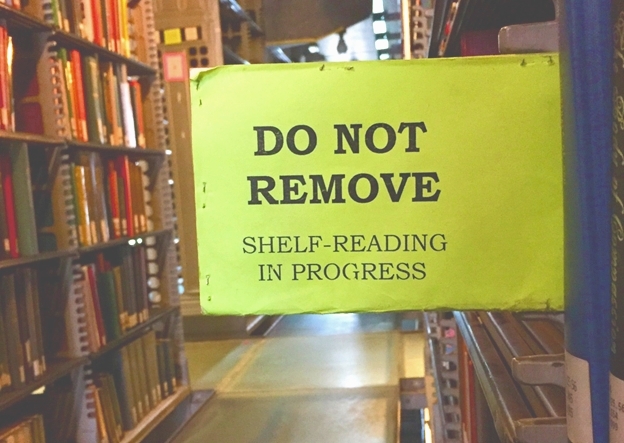 Photograph of a sign in the stacks that says, “Do Not Remove, Shelf-Reading In Progress.” by Brandon Harrington, at the Burke Library at Union Theological Seminary (2018). Since December 2016, I have been playing the vibrations between student and Library Circulation Assistant. The library is where I work in a double sense. But over the course of my time at Union, the two roles have collapsed into one another, and I can honestly say that my education at Union would have been very different had I not gained extensive familiarity with Burke’s collection. My knowledge of Burke’s holdings has grown through sharing in the curiosity and creativity of countless patrons. Helping researchers find books has been an education in and of itself, taking me to aisles and titles I would likely never otherwise explore. But apart from assisting patrons, my familiarity has grown most through shelf-reading. Shelf-reading, a crucial part of library maintenance, is one of the responsibilities that comes with being a Circulation assistant. It consists of going through the stacks, book by book, to make sure the collection is shelved correctly. It helps us find books that were mis-shelved and marked “lost,” pull books in need of repair, and return books to other Columbia libraries that wound up in the Burke stacks. With a total of over 700,000 onsite books in 5 levels of stacks spanning 24,580 square feet, it is rather easy for a book to find its way onto some distant shelf, far from where it should be. While shelf-reading is an essential task for ensuring that patrons can locate resources, the task of shelf-reading sounds tedious. But my not-so-secret secret is that I love it. Reviewing the breakdown of the Union stacks, I realized how drastically today’s collection has changed in character with the continually-growing LC stacks, just as the population at Union has evolved over the years. The latest incoming class is reportedly the most religiously diverse, including the largest population of unaffiliated students Union has ever welcomed. Looking back on the ideals, assumptions, and goals that went into the organization of the Union stacks, it became clear to me how much the collection is a relic of the Seminary’s past character. So much so that it seems to describe a different Seminary entirely from the one I have come to call my home. Because of its date of production, the Union classification has no designation for Liberation or Feminist or Womanist or Queer Theologies. No space within its categories for the theological voices that have been so formative and foundation for me and for many of my peers. No space for the ways of doing theology that have since emerged largely within Union’s walls. Shelf-reading the collection today, I find that the sections most out of order best reflect the evolving character of the Union community. While I recognize the necessity for our books to be organized, I revel in the disordering that happens. Reading the stacks reveals a latent sense of Burke’s community of readers. The disordering archives a challenge to its organization, a manifestation of the fact that new works are being produced, works that might give cause for reorganizing the collection, works that will push the boundaries. The books on the shelves change constantly, and the bits of information, communicated through the collection itself, speak volumes with a moment of pause and a little attentiveness. I find in the disorder a remnant of the community I will soon leave after graduation. Two weeks ago, we lost Rev. Dr. James H. Cone, the founder of Black Liberation Theology. Since Cone’s passing, the section where his books are housed has thinned quite a bit. I know that folks are returning to his words, continuing to hear his voice through his writings. It reminds me of something I noticed in the library while taking Prof. Cone’s course, Foundations in Christian Theology, the last time Dr. Cone taught this course, the course with the infamous 20-page syllabus. I saw Dr. Cone’s impact through the changes in the stacks. Cone repeatedly encouraged: “You have to find your theological vooooooice.” Over the course of the semester, the BT section, the LC classification for “Theology,” swelled and compressed, mirroring the theological turns we traced every Tuesday morning under Dr. Cone’s passionate and meticulous guidance. We were pulling books to find our voices. I graduate in eight days. We have almost completed shelf-reading the LC stacks. They are reset for another round of disordering, and I wonder how the stacks will bear the remnants of its community in the years to come. As I close this chapter of Circ assisting and graduate study, I am grateful to have had the opportunity to read the stacks and to see through them the reflections of the Union Seminary I have known and been a part. Julia Pettee, Classification of the Library of Union Theological Seminary in the City of New York, ed. Ruth C. Eisenhart (New York: Union Theological Seminary, 1967), iii. This entry was posted in Collections and tagged Behind the Stacks, Burke Library, library science, Processing, students, Union Theological Serminary on May 11, 2018 by Carolyn Bratnober. My last day really snuck up on me. One can really get lost in boxes and boxes of unprocessed archival material, it seems. But all good things must come to an end, and for me, that took place today. 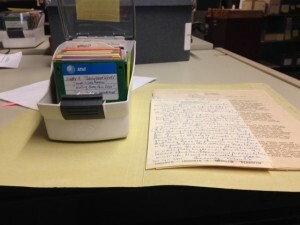 After a great 7 month internship at Burke, I closed the lid on my last archival box. I can’t express to you how great this internship has been! I’ve learned the entire archival process, from acquisition to finding aid promotion. I’ve seen great material that paints a picture of the world the missionaries encountered. And I’ve worked with the amazing staff at the Burke Library. Brigette, the project archivist, was an outstanding teacher and mentor. From the very beginning she made sure I knew what we were working on and why. She is incredibly knowledgeable about the collection, knowing where everything is and how the entire collection is connected. The rest of the staff is stellar as well. They are insanely smart, friendly, welcoming, and passionate about the work they are doing at the library. If you ever get a chance to work with them on a research project, I suggest you do. Though my internship time is done with the Burke library, my professional and personal relationship will continue. I look forward to my next step, knowing that Burke is the reason I’m taking it at all. This entry was posted in Student Entry and tagged Archives, Burke Library, Graduate Intern, interns, MRL, Processing, students on August 1, 2014 by Sarah Davis. I spent yesterday and today getting acquainted with my first archival box. To learn and get experience with writing a finding aid, I’m working with materials that already have a finding aid, “The Chinese Church of Christ in Korea papers 1908-1975.” Some of what needed to be done was basic copy editing and formatting the document. But the fun part was getting to explore the folders in the box. Part of what I was doing was comparing the box content to the descriptions in the finding aid, to make sure that it was accurate, and as detailed as it needed to be. 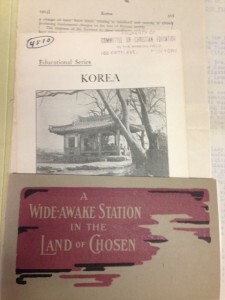 Exploring documents that ranged from handwritten letters to missionary history to brochures about Korea, I had to remind myself not to read the documents themselves. Processing an archive isn’t about reading the documents. Handing me pages and pages of typewritten and handwritten documents and telling me not to read them takes willpower! I only skimmed. I told myself I was familiarizing myself with the documents, and checking to see if any details jumped out that would improve the level of historical detail in the finding aid, to help researchers (and those searching on the web) find it, with better keywords. Yeah! That’s what I was doing. Not reading! No reading here! After I submitted my work on the finding aid for edits, my next task was to work my way through a box of floppy disks, get the documents onto the hard drive so they could be processed. Some of the disks I handled had one or two files on them, mostly Word documents, sometimes a PowerPoint or PDF. It is a little bit mind boggling to think about the fact that only a few decades ago, our portable media could hold mere kilobytes or megabytes of data. And now, several gigabytes can fit on an even smaller device. Today, I worked with, and handled documents that were typed or handwritten in the early 20th century. And floppy disks with documents saved in the early 2000’s. I’d call that a very good day! This entry was posted in Collections, Student Entry and tagged Chinese Church of Christ in Korea, interns, Korea, library science, Missionaries, MRL, MRL8, Processing, students on July 18, 2014 by Elizabeth Willse. I want to put in a quick plug for the collection that I just finished…on my LAST day of my internship here at the Burke Archives. Then I'll do a little wrap up of my time here and what I learned. WAB: State Council of Churches Records, 1943 – 1974. Abstract: Regional ecumenical and interfaith organizations come together under the umbrella of their respective state council of churches. Rooted in local communities they are able to respond to needs specific to that region. These councils are agencies of cooperation focused on service and Christian unity. Collection contains bulletins, magazines, newspapers, pamphlets, correspondence, annual meeting minutes and reports. Collection Scope and Content Note: The majority of the collection is comprised of state council bulletins or newsletters and annual state council meetings. New York, Ohio, Massachusetts and New Jersey form the bulk of the collection. 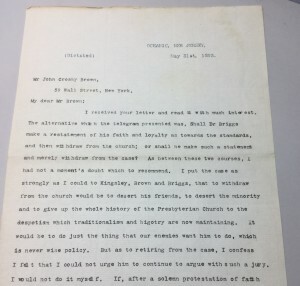 Of note within the New York collection is a smaller collection pertaining to the New York City Protestant council, which was a large regional council serving the local needs of the city. The Ohio collection is a large run of the Ohio Christian News dating from 1946 to 1971. The Massachusetts collection also contains a large run of the state council’s newsletter Christian Outlook and copies of annual reports. The New Jersey collection contains reports of its annual meetings from 1958 to 1974. Michigan is contained in block parenthesis because the state was inferred from locale information contained in the annual meeting report. The collection is arranged alphabetically according to state. Within the state divisions, state councils are organized first with county, regional and city councils following. Each folder is arranged alphabetically and the materials within those folders are arranged chronologically. Other state councils in the collection include Alabama, California – Nevada, Colorado, Illinois, Indiana, Maine, Minnesota, Oregon, Texas, Vermont, Virginia and Washington. My final day at the Burke has arrived. My time here has gone by amazingly fast and I am surprised with the fact that I was able to complete the processing and DAM on four collections. Granted one collection contained a single book, but it still feels good to have some experience under my belt. So did I accomplish what I hoped to accomplish, was the experience all that I had hoped it would be? Absolutely! This was definitely the place where I could test my theoretical knowledge of archival processing by putting it into practice. The mundane tasks of sorting, discarding, re-housing and labeling are no longer intimidating mysteries. Not surprisingly, considering my love of organization, those mundane tasks were some of my favorite activities. Thankfully, I encountered no bugs and only a little bit of dirt and dust. I was able to shift my focus from item level description to box and folder description and adhere to the “More Product Less Process” standard. I gradually figured out how to limit my tendency to be verbose in regards to my historical notes and scope and contents notes. While I’m not perfect and still have a difficult time using sentence fragments in the abstract, I am much better at it than when I started. It’s nice to see less and less corrective red from Brigette on them. I even enjoyed being able to put my long dormant historian training to use while I was researching historical and biographical information regarding the collections. Learning how to do archival processing, while important, was not my only goal. I wanted to learn and experience a way to make internships not only benefit the institutions, but teach students life-long lessons. My final paper for my Practicum focuses on the need for constructionist and constructivist based learning as a way to engage students more actively in the learning process. Both methods encourage students to actively interact and create within and with the physical world rather than passively receiving knowledge; however constructionism additionally requires the production of a tangible object in the final outcome. Learning becomes more than knowledge acquisition and becomes a process of identity formation and empowerment. Mentors, supervisors, and teachers who use these approaches make it easier for students to see their work not only as personally enriching but also of value to the community they are serving. As such, new knowledge is not only more effectively embedded in the students mind, but the students become embedded in the community they serve. I’m only using this high flung academic-speak to illustrate that Brigette uses these approaches to teaching archival practice and processing. I did not just create finding aids, but I made them available online increasing access, spoke about their relevance in various blog entries, posted information regarding the new collections on Twitter and Facebook, I was even informed one of the collections was given to me because a user had requested the material and the library wanted to accommodate the request in a timely manner. I did not just learn archival theory or just the do’s and don’ts of archival processing, but I created a tangible object that tied me to a community of archivists and archives users. Eventually I began to describe myself as an archivist when asked what I do. I am no longer just a library graduate student, but because of what I was able to accomplish I now identify with being an archivist. I no longer limit my job searches to special collections or museum libraries. It was great to see this teaching method in action and see the personal affect it had on me. If you are still on the fence regarding archives, if you don’t have a clue what to do in an archive, even if you love them I would recommend coming here for an internship and becoming part of the archivist community. It was a great experience! This entry was posted in Student Entry and tagged interns, Processing, students, WAB on December 10, 2012 by Bree Midavaine. Now that you know a little more about the MRL and WAB collections, as well as the Luce Foundation, I thought it would be useful to explain the reason behind needing this project in the first place. Most, if not all, archives and libraries have what we call "backlog." Our collections are continually growing: we gather historic documents; professors, alumni, etc… donate their records; people leave material to us in their will; things like that. Unfortunately we don't always have the time (or the funding) to fully process and make available collections as soon as they come into our possession. We give them basic care, security, and the proper environmental conditions and control, but physically arranging and intellectually describing materials can be very time-consuming. Enter the first reason for this project. A second major reason for this project and the need to care for MRL and WAB specifically is due to the damage suffered during a major water incursion disaster in the Burke's modern archives stacks in June 2003. Water from a plumbing accident in the Brown Tower (this Brown is not the same as William Adams Brown! ), two floors above, saturated materials from the WAB and MRL collections. The wet papers in disintegrating boxes were quickly removed, relocated, shipped out as an emergency, recovered by vacuum freeze drying, and returned. These collections, which had already experienced a variety of temperature and humidity changes from being used throughout the world by missionaries and ecumenists, became even more fragile and disordered. There was approximately 300 linear feet returned in a state of disarray, with WAB and MRL collections intermixed and much of the original order lost. The MRL Archives present the special challenge of fragile acidic materials. Various climates combined with being stored for almost a century in acidic boxes in over-heated conditions throughout the history of the actual Missionary Research Library added to their fragile nature. Many unique items are tightly folded and require time, patience and preservation techniques to unfold and care for the items in the long-term. Throughout the duration of the Luce Project at the Burke Library, which just passed the one-year mark, we will arrange, describe, and provide wide access to a total of 573 linear feet of hidden archives. This project will process the collections so that they are organized and described, with basic preservation treatment through stabilization in acid-free containers, ordered arrangement, and removal of corrosive metals and other materials. This arrangement will enable more advanced preservation treatment and the potential for surrogate copies and selective digitization on those materials which have been stabilized. For the first time, researchers will have access to many first-hand descriptions of cultural conditions documented by missionaries, physicians, and social workers in Asia, Africa, Australia, North America, Oceania, and South America throughout the 19th and 20th centuries. This project will also be the first to provide access to the records of some of the most important events and institutions in the history of the worldwide ecumenical movement, with especially rich documentation of the religious and cultural history of New York City. This entry was posted in History and tagged Archives, Description, Luce, MRL, Preservation, Processing, Use, WAB, Water Disaster on August 23, 2012 by Brigette C. Kamsler.